Is County Government the Solution? Last month’s column boldly proclaimed that “Local government is the solution, not the problem.” The theme was motivational, challenging past and current negative assumptions about government. Several types of governments were highlighted including a mixture of 90,056 local entities which form the largest group of settings for public administration. But if local government is the solution, as the article asserted, how adept is it at solving its problems? Problems form an inherent part of government policy. As Richard J. Stillman II has noted, public administration “deals with the formulation and implementation of public policies involving a considerable range of problems concerning human behavior and cooperative human effort.” One of the best ways to evaluate an organization is to assess how it solves its problems. To evaluate local government’s capacity in this critical area, general purpose local governments consisting of municipalities, townships and counties, form a familiar starting point. To further refine the focus, counties are featured for this segment of articles. First, their historical background is provided. Second, a general review of county services is presented. Finally, one full-service urban county is assessed. The historical importance of the county is deep. According to Lawrence L. Martin, the county form of government dates back to the Shires of the Kingdom of England starting around 800 A.D. Many of the official titles from that distant time remain with us today including the Sheriff, the Tax Collector and the Coroner. The colonists transported this form of local government to America starting in 1634 in the Commonwealth of Virginia and subsequently to the Massachusetts Bay Colony in 1643. Today, 3069 county governments, staffed by 3.6 million professionals spend $554.4 billion annually serving 308 million residents according to National Association of Counties. Although their specific services vary, they can be grouped into four general classifications: transportation and infrastructure, community health, justice/public safety and county management. Within these broad categories, numerous important services are provided including roads, bridges, airports, transit, utilities, solid waste and recycling programs, hospital and health clinics, behavioral and substance abuse programs, immunization, police services, county courts, coroners, jails, fire/rescue services, emergency management, 911 call centers, parks/recreation, housing, community development, tax collection, assessment and elections. 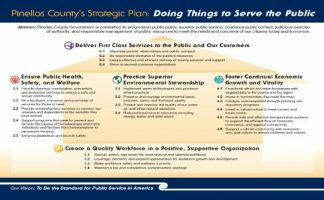 The actual list is exhaustive, and includes numerous additional services within a deep matrix of sub categories, revealing the magnitude and reach of county programs that public administration provides. The Office of Budget and Management’s 2017 memorandum indicates 85.7 percent of our population resides within one of 383 Metropolitan Statistical Areas (MSAs) are comprised of 1,169 urban counties. These are the ones that provide the largest assortment of the services listed above. Pinellas County, one of four counties located within the Tampa-St. Petersburg-Clearwater MSA, presents a good example of a large urban county for a short case study to assess its problem-solving capabilities. Its estimated 2017 population was 970,637. The county is formed by a peninsula on the western extremity of Tampa Bay, a large estuary on the Gulf of Mexico side of Florida. St Petersburg and Clearwater, its two largest cities, serve as flagships for the primary activities of tourism and real estate. Pinellas County is completely developed or as the locals term it, “built out.” After several years of stagnation or modest decline, its population has recently increased due to high-density redevelopment. Roughly 60 percent of its citizens live within 24 organized municipalities while the remainder reside in developments located in its unorganized territory. Regardless of jurisdiction, Pinellas residents receive the benefit of a robust array of urban services. Since urbanization requires counties to simultaneously expand existing and add new services, its capacity to predict and determine problems ultimately determines its present and future value. This requires a mixture of short-term and long-term strategies are based on its ability to recognize pending problems and proactively adjust to manage them. As Bryson and Crosby have noted, strategies provide a framework for tactics within two basic time-frames. Short-term adaptive strategies are used to obtain limited objectives while long-term proactive actions are used to achieve broader goals. Both are important. But to accomplish a delft management footing within these often competing dynamics, a strategic plan is required. Strategic Planning is a collaborative effort which engages the organization’s direction for a period of time. The outcome is a written strategic plan that focuses on agreed goals and steers the organization to remain focused as goals are accomplished. It contains a vision, mission, values, goals and objectives that are summarized into an action plan. As Thompson and Strickland indicate, strategic plans combine all organizational plans into a focused effort to achieve their mission. Together, they specify where the organization is heading and how management intends to achieve targeted results. Pinellas County has a well-developed strategic plan driven by its mission: Pinellas County Government is committed to progressive public policy, superior public service, courteous public contact, judicious exercise of authority, and responsible management of public resources to meet the needs and concerns of our citizens today and tomorrow. On the surface, their approach appears to be promising. Not all counties even have a strategic plan. But how well are they actually doing? Are they using it to recognize problems with well-managed solutions? These questions form the focus of next month’s article.